Dropbox is an online service that lets you store, sync and share files online. It works with Windows (XP and Vista), Mac OS and Linux. Previously available as invites only, Dropbox is now available to everyone. It is still in beta at the time of the review. The free registration has 2GB space allowance. Additional 50GB – which is the only option – is available for $99 a year (or $9.99 a month). The free 2GB storage is handy as a USB drive replacement for shuttling files between work and home. Other great idea is as a home backup solution. This would reduce the hassle of getting external USB drive and plug it in to the computer at backup time. The files on Dropbox system are stored in Amazon S3. Thus, Dropbox utilises most features and reliability of the S3. Dropbox works well behind the corporate firewall as long as port 80 or 443 (HTTP or HTTPS) are accessible. Windows built-in disk defragmenter is the stripped down version of the Diskeeper. The full version of Diskeeper has advanced features such as helping to prevent fragmentation of the MFT (Master File Tables) amongst others. 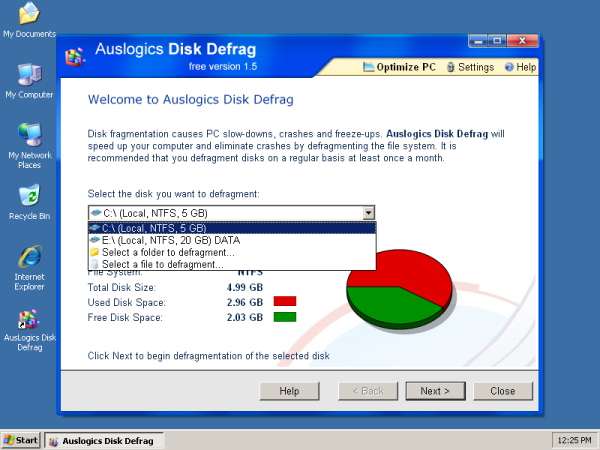 For a free alternative, there is Auslogics Disk Defrag. Despite it has less features, Auslogics Disk Defrag is faster and has friendlier user interface. It is compatible with Windows Vista, XP, 2003 and 2000 (32-bit and 64-bit) and optimised for dual-core CPU.